Which Port Did Johnny Symington Enjoy This Christmas? Just before Christmas our Vintage Port Site blogger asked the Symingtons and colleagues around the office what Ports they would be enjoying with their holiday feasts. Sorry not to reply earlier, I only decided on Christmas eve. Having had a Pre launch taster of the Graham’s 1952 at last years Christmas lunch (before it was the Graham’s 1952 Diamond Jubilee Port and before it was approved by the palace and served at the Sovereign Heads Lunch at Windsor Castle). I decided on Christmas Eve this year that I would finish the Diamond Jubilee year with the same wine and celebrate and reflect on the outstanding PR success that this wine has had for Graham’s. So as I sipped and reflected at our Christmas Dinner this year the overwhelming thought was “no wonder it was such a success, the wine is so delicious and over delivers in every respect”. As we go into 2013 this wine becomes a collectors’ item of great rarity and significance. You can read more about which Ports we enjoyed during our holiday festivities on The Vintage Port Site blog. How about you? What Ports have you enjoyed this holiday season, or are looking forward to in the coming week? We would love to hear from you! The Chryseia 2007 Douro wine, made jointly by the Symington family and Bruno Prats, drew many superlatives from those present. João Vasconcelos, Graham’s Market Manager for the UK, echoed Paul’s sentiment and mentioned that many of the Wine Society members attending the dinner made a point of letting him know that this was, by far, the finest Festive Dinner organized by The Society. Following his welcome speech, in which Paul described how the great wines of the Douro are his family’s very lifeblood, it was time for fine Portuguese cuisine, accompanied by fine Portuguese wines (made by his family), to take centre stage. Each wine was described by Paul, as each course was served. Rui Paula designed the menu around the wines (Symington family Douro DOC wines and Graham’s Ports) and in this task his acknowledged talent was once more revealed: the perfect food and wine matches were unsurpassed. Rui thanked The Wine Society and Paul Symington for the unique opportunity to showcase his cuisine outside his native Portugal, where he owns and runs two of the country’s finest restaurants; one in Oporto (‘DOP’) and the other in the Douro region (‘DOC’), both of which have legions of fans. Other highlights of the evening were the Graham’s Ports that were served with the dessert and cheese courses. The Graham’s 20 Year Old was served at just the right temperature (lightly chilled) with the exquisite ‘Abade de Priscos’ pudding, whilst the Graham’s 1970 Vintage Port stole people’s breath by its sheer quality (although those familiar with this Graham’s landmark Vintage weren’t in the least surprised that this Port still delivers so much pleasure, showing many years of life still ahead of it). The Graham’s 1970 Vintage served with traditional Portuguese cheeses (Serra, Ilhas and Azeitão) was triumphant. The excellence of the table wines was also extolled, the Altano Quinta do Ataíde 2008 Reserva interacting perfectly with the rich flavours of the ‘Francezinha’ (Traditional Oporto Veal Sandwich with Mozzarella Cheese and Crayfish Sauce), whilst the Chryseia 2007 married beautifully with another traditional Portuguese dish — the Suckling Pig with Potatoes Gallete (‘Leitão com Batata Gallete’). Graham’s 20 Years Tawny impressed guests as a perfect dessert accompaniment – served at just the right, lightly chilled, temperature. The venue of the dinner, The Merchant Taylor’s Hall has occupied its present site between Threadneedle Street and Cornhill since 1347, in other words, it has stood in the same site for over 600 years. The Merchant Taylors’ Company is one of the Great Twelve Livery Companies of the City of London and can trace its foundation back over 800 years. Livery Companies, or Guilds as they were previously known, began in mediaeval times as fraternities, which were often religious but also existed to protect the interests of particular trades. The Wine Society owes its existence to the Great Exhibitions of the mid-19th century. For the last of these, in 1874, various countries sent large quantities of wine in cask to be stored in the cellars of the Royal Albert Hall where, to quote from an early history: ‘it entirely escaped notice from the visitors’. Portuguese growers, who had taken great efforts to present their wines, appealed for help and it was the subsequent efforts to promote their sale that laid the seeds for the foundation of the Wine Society, the world’s longest established wine club. Yet another long-standing tie between Portugal and Great Britain, who share the world’s longest standing alliance between two nations. Paul Symington will be the guest of honour at The Wine Society’s 12th Annual Festive Dinner, which will be held on Tuesday, December 18th in the magnificent surroundings of Merchant Taylor’s Hall in the City of London. The Wine Society extended the invitation as a way of celebrating Portugal and the wines of the Douro, with Paul’s Decanter Man of The Year 2012 Award still fresh in people’s memory. Portuguese cuisine will also take centre stage: Rui Paula, one of Portugal’s most talented chefs, was asked to prepare a special menu for the occasion consisting of 5 courses, which will be served with a selection of Douro DOC table wines produced by the Symington Family in their own Douro Quintas, and of course with Graham’s Ports as well. The Vintage Port will be one of Graham’s 20th century classics, but we don’t want to spoil the surprise by identifying the year (for the benefit of those fortunate enough to have booked a place for the dinner, which was sold out not long after being announced). The Graham’s Dry White Port will be served as the aperitif and another two Graham’s Ports are to be served with the dessert and cheese courses. Superb food and wine matches will be the order of the evening; Rui Paula has designed the menu around wines that he is well acquainted with, not least because he was born in Oporto and his family comes from the Douro region, which has long provided one of the main sources of inspiration for his creations. Rui Paula, enjoying a glass of Graham’s 20 Years Tawny at his ‘DOP’ restaurant in Oporto. The Wine Society, founded in 1874, is the world’s oldest wine club and its declared mission is to “introduce members to the best of the world’s vineyards at a fair price.” The Symington family’s relationship with this unique organization has been a very fruitful and enduring one; the family has supplied The Wine Society since its very beginnings in the 19th century. Watch this space, in the comings days we will let you know how the evening went. Hong Kong Kee Club: Graham’s Ports featured in a very enjoyable Port and Food Pairing party held on October 26th at Hong Kong’s exclusive Kee Club. The well attended party attracted over 100 VIP guests, keen to take part in this, the third edition of the popular event held jointly by Graham’s and Taylor’s. The evening was hosted by Graham’s Euan Mackay and Jorge Nunes, supported by Howard Palmes from Fine Vintage Ltd — Graham’s distributor in Hong Kong. Nicholas Heath from Taylor’s was also present. A variety of food pairings were offered to match a selection of Ports from the Graham’s range, and these included: Graham’s Late Bottled Vintage 2006 with Francesca Hazelnuts covered in dark chocolate; Graham’s 20 Year Old Tawny served from a unique 4.5 litre ‘Jeroboam’ bottle with Foie Gras; Graham’s 20 Year Old Tawny jelly on a chocolate biscuit and Graham’s 1980 Vintage Port with Venison Patties. For more in-depth information on Graham’s superb 1980 Vintage Port, please visit The Vintage Port Site. Graham’s Aged Tawny Ports make wonderful food matches. The thrilled guests were left fully converted to the exquisite symbiosis that can be achieved between a great variety of foods and the wide-ranging styles of Port, which make it one of the most versatile of wines. Some Ports lend themselves more to the aperitif occasion, whilst others are better suited to enjoyment as after-dinner wines. The various serving opportunities also define the appropriate temperatures at which specific styles of Port should ideally be served. The enjoyment of aged tawny Ports, in particular, may be greatly enhanced by serving them lightly chilled. A prize draw was held and the lucky winner took home a bottle of the superb Graham’s 1969 Single Harvest Tawny Port. Euan Mackay presents a bottle of Graham’s 1969 Single Harvest Port to the satisfied winner of the prize draw. Tainan, Taiwan, November 2nd: Jorge Nunes, Graham’s Asia Pacific Market Manager, stayed in party mode, flying off to Taiwan just a few days after the Hong Kong event in order to host a wine dinner in the historic city of Tainan (the ancient capital of the country). This Altano – Graham’s dinner was jointly organized by our importer, St Finesse and by our local distributor, Bacchus. The dinner showcased the Symington family’s Douro Altano still wines, as well as their best-known Ports from Graham’s. Jorge Nunes, centre, at the restaurant in Tainan. On his left is Sonia from Bacchus, the distributor in Tainan. Tainan proved an inspired venue for this most entertaining wine dinner. It is the oldest city on the island and proudly regards itself as the birthplace of Taiwan. The city boasts a rich cultural heritage, including rich culinary traditions, which make it stand out in the country as a centre of fine cuisine. The Taiwanese themselves admire the city for its charm, and its friendly inhabitants who are very welcoming to outsiders, including an increasing number of foreign visitors. Jorge Nunes, Graham’s Asia Pacific Market Manager. To his right, Dave Huang, President of our Taiwan importer: St Finesse. A month has passed since our last visit to Quinta dos Malvedos and Tua, and whilst the grass is much greener and a few vines still have brightly coloured leaves clinging, the vineyards generally appear more barren as the leaves have fallen and we have begun the annual pruning. The train trip was a good study in localised climate: in Vila Nova de Gaia it was clear and quite cold (beautiful full moon and stars visible as I walked), at Campanhã train station on the other side of the river in Porto there was a thick mist which more or less persisted as we got up into the mountains around Marco de Canaveses where, in addition to the mist, there was thick frost on the ground. As we came out of a tunnel onto the Douro River west of Regua there was no sign of frost and the sun was starting to penetrate the mist, and before we reached Regua the sun through the train window was strong enough make you wish for sun cream. In the morning as we walked through Quinta do Tua it was warm enough to shed the coat. Welcome to winter in northern Portugal. Our viticulturist Alexandre Mariz says November’s weather pattern has been pretty normal – meaning, we have had some rain most weeks, as evidenced by the rather lush grass in our terraced vineyards. 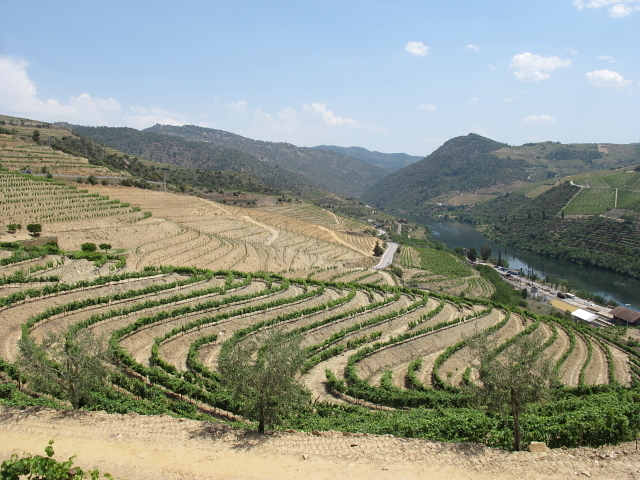 Compare our photo of the new plantation at Quinta do Tua 1 June – very green vines, but utterly barren brown soil – with Thursday’s photo – the vines are invisible without leaves and the Touriga Nacional in the foreground has been pruned, but each terrace is carpeted in green. The focus of our work in the vineyards is now the pruning. To give you an idea of the scale of the task: our annual labour costs in the quintas work out roughly one-third harvest, one-third winter pruning, and one third everything else all year round. To prune, we make three passes through all our vineyards. First, the pre-pruning is a mechanical process, whereby the bulk of the vine growth is roughly sheered off. Next is the entirely manual job of pruning each and every vine, and then pulling off the remaining pieces caught in the trellis and leaving them on the ground. Finally the third pass is the cane shredding, where a tractor tows a device that breaks up and shreds the old canes lying on the ground. This shredded plant fibre is left to break down and add much-needed organic matter to our rocky soil. In some of the old walled vineyards where we cannot pass through with a tractor, the pre-pruning is manual and the cut canes are not shredded, but collected by hand and burned. At Malvedos and Tua we have a gang of six who do the manual pruning. Each worker has electric secateurs which make the job much easier on their hands, and much faster generally. Their red vests contain a battery pack to power the secateurs, which are strong enough to cut through an old thick vine if need be. The point of the pruning job is not only to clear away this year’s spent growth, but to select and trim down vine spurs with two buds which will become next year’s vines. When well done, the vines grow in neat pairs along the length of the spur from the main trunk, and this is the best time of year to appreciate the stark beauty of a well-trained vine, before it has been pruned. Pruning will continue through February, with the youngest vines done last, as they need special attention to begin shaping them properly. The Douro DOC region is defined by its schist soil – and in fact our “soil” is fundamentally rock dust, hence the need to plough in our pruned and shredded vines each year to add organic matter to the soil. People wonder how the vines can grow in near solid rock. Our answer is that schist is layered – try to imagine something like phyllo dough but stone – and the roots of the vines actually penetrate between those layers. At Quinta dos Malvedos we have been doing some landscaping work to re-build terraces, and the bulldozers uncovered this outcropping of schist where you can see clearly roots emerging from between the layers of stone. Our Douro grape varieties are nothing if not determined! Adalberto Andriolo Junior and Tatiana Pereira de Sousa from São Paulo, Brazil. November was a very busy month for Graham’s, as work continues at the partially renovated 1890 Lodge, where the most complete Port visitors’ centre is taking shape in Vila Nova de Gaia. Sections of the refurbished building, including a new reception, museum and shop, were opened to the public on November 12th. It was with great pleasure that Ana Rodrigues and her team welcomed the very first visitors — Adalberto Andriolo Junior and Tatiana Pereira de Sousa from São Paulo in Brazil. As our first visitors, Adalberto and Tatiana were given a comprehensive tour of the museum, which charts the history of the Graham and Symington families, illustrating how they made Graham’s into the renowned company it is today. Interestingly perhaps for Adalberto and Tatiana, in the 19th century Brazil was one of the leading markets for Port and records show that during the second half of the 1800s, it was the second biggest market, straight after Great Britain. For example, in 1867 total shipments of Port to “The Brazils” were 6,449 Pipes (or nearly 5 million bottles), growing to 9,612 pipes just two years later. Graham’s, which at that time was already one of the largest exporters of Port, is again working hard to build its presence in Brazil, where demand for fine Port is once again a reality. We hope Adalberto and Tatiana will return to visit us again in the not too distant future. When they next visit, they will be able to enjoy the food and wine at the new VINUM restaurant in the 1890 Lodge, due to open during the first half of February, 2013. Besides the great food and wines, the VINUM will be blessed with one of the very best views over the twin cities of Porto and Vila Nova de Gaia. Ana and Hermínio in the new reception area, eagerly awaiting their first visitors.